Google is the most comprehensive search database in the world, but the mass uptake of smartphones has rendered their extensive page-by-page search results clunky and overwhelming. Working on the premise that mobile users need fewer, more accurate results, Adswipe is an advanced search technology, designed specifically for mobile, which provides personalized results powered by an intuitive swipe action — similar to that of the hugely successful dating app Tinder. Although Google personalizes search results based on the user’s search history, the 10 results per page format is far from ideal for mobile users — which make up 40 percent of all searches — since the screens are too small to let the users view the seemingly endless list easily. Adswipe’s simple, swipe mechanic enables the platform to continually refine users’ results as they browse. Results are presented as though they are in a stack — displaying the top search finding only. The user swipes right for relevant findings and left for irrelevant ones, and the remaining results are immediately reordered accordingly. 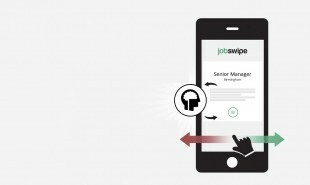 Adswipe has developed the first app powered by their search tool: Jobswipe, a job search app which lets jobseekers browse and personalize search results, using the swipe action to create shortlists of relevant pages. Adswipe have also trademarked HomeSwipe and CarSwipe. What other industries could utilize this intelligent search technology?